This Structures Engineering Design Manual has been prepared by Structures Engineering Section of Main Roads Western Australia to provide a guide to the design of bridges and associated structures within MRWA. The Manual is intended to fill a gap not covered by either the Bridge Design Code or standard text books. The Bridge Design Code provides detail of design principles, loads and standards to which all bridges designed by, or for, MRWA must comply. It does not, however, cover the application of these principles. On the other hand, standard texts cover structural analysis and design theory and application, but few are specific to bridge design in accordance with Australian codes. This area of specific application is what this Manual is designed to address. It is intended to be complementary to the Bridge Design Code and standard texts, but does not repeat material they contain, making use instead of a comprehensive list of references. The Manual is also complementary to the Procedures in the Structures Engineering Management System. There is some unavoidable overlap between the two, but in simple terms the Structures Engineering Design Manual presents HOW things are to be done, whereas the Procedures detail WHAT is to be done, by WHO and WHEN. 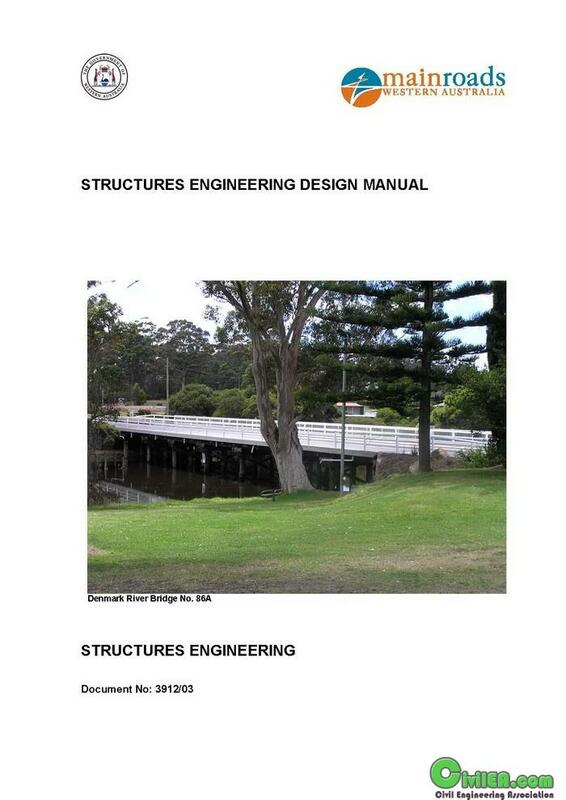 This Manual is also complementary to the Bridge Branch Design Information Manual. Again, there is some overlap between the two, but basically the Information Manual is more mandatory, and presents MRWA specific variations or conditions that apply to the HOW things are to be done, as outlined in this Manual. Each Chapter of the Manual has been written by an experienced, senior design engineer, with subsequent review and comment by other staff. It is intended for use by all members of Structures Engineering, but should be particularly useful as a training aid for new members of staff. It was this “young, qualified, but inexperienced engineer” that was the “target audience” during production of the Manual. It must be stressed that the Manual is not a “cookbook” that can be freely used by all. It assumes a sound knowledge of structural engineering principles, awareness of the appropriate Codes and Standards and some background in bridge engineering. It must only be used by qualified engineers with some knowledge of bridge design, and/or under the supervision of an engineer experienced in bridge design. Although every care has been taken in the preparation of the Manual, because of the lack of control over its application, NO RESPONSIBILITY WHATSOEVER is taken for its use. It is intended that the Manual shall be a dynamic document, subject to continual review. The need for change may occur due to the development of improved methods of analysis, new construction techniques, revised design standards etc. The Manual is the responsibility of the Senior Engineer Structures. However, all proposals for change shall be submitted in the first instance to the Structures Design and Standards Engineer. The Manual is a controlled document as described in the Structures Engineering Document Control Procedure. In particular, a record shall be kept of the issue of the Manual to ensure that modifications are circulated to all.